As if things couldn’t get any worse for the Yankees rotation, after the injury to Ivan Nova and suspension of Michael Pineda, CC Sabathia has continued to struggle. Not only are they not improving, Sabathia took a big step backwards with his last start. On Sunday against the Rays, Sabathia lasted just 3 2/3 innings, allowing 5 ER on 10 hits. That’s a stat line that just isn’t going to cut it, especially when you are expected to be a top of the rotation starter. Sabathia now sits with a 3-4 record and 5.75 ERA on the year. No one was expecting Sabathia to be the ace of the team this season. It became very apperant last season that his years of dominance are behind him. But it was expected that Sabathia would make the necessary adjustments needed to turn things around. Although it wasn’t expected to be an easy process, now there is doubt as to just how much he will help this team. 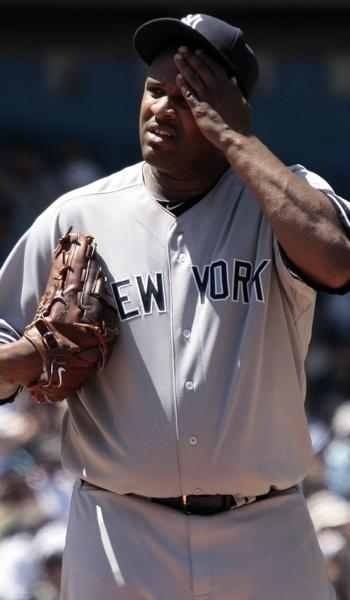 I’m glad Sabathia still has confidence in himself, as he very well should, but I don’t know if the Yankees should. I’ve always liked Sabathias competitive mentality on the mound, as all great players need to have that in them, but I’m beginning to doubt if he will be able to fully adjust to his diminished velocity. You won’t ever confuse Sabathia with a “soft tossing lefty,” but he’s going to have to find some middle ground between that and the power pitcher he once was, and fast. The Yankees desperately need someone to step up and give them production behind Tanaka in the rotation.